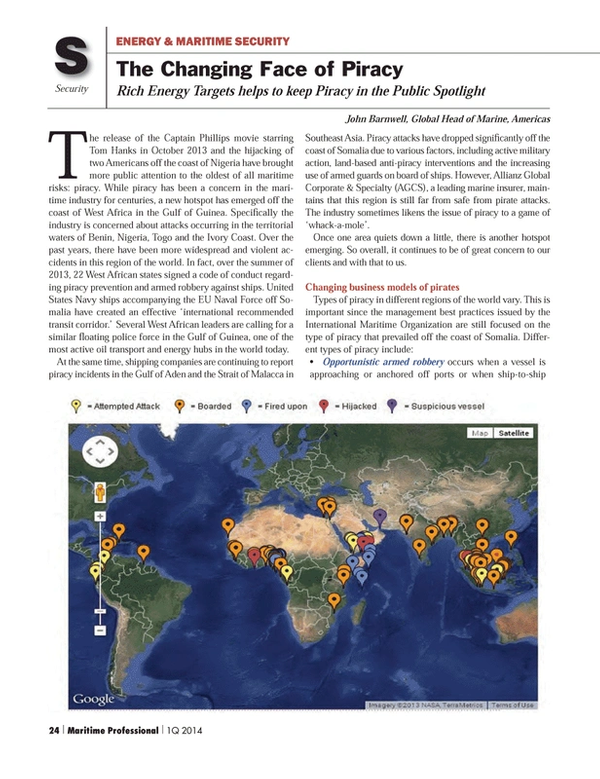 The release of the Captain Phillips movie starring Tom Hanks in October 2013 and the hijacking of two Americans off the coast of Nigeria have brought more public attention to the oldest of all maritime risks: piracy. While piracy has been a concern in the maritime industry for centuries, a new hotspot has emerged off the coast of West Africa in the Gulf of Guinea. Specifically the industry is concerned about attacks occurring in the territorial waters of Benin, Nigeria, Togo and the Ivory Coast. Over the past years, there have been more widespread and violent accidents in this region of the world. In fact, over the summer of 2013, 22 West African states signed a code of conduct regarding piracy prevention and armed robbery against ships. United States Navy ships accompanying the EU Naval Force off Somalia have created an effective ‘international recommended transit corridor.’ Several West African leaders are calling for a similar floating police force in the Gulf of Guinea, one of the most active oil transport and energy hubs in the world today. At the same time, shipping companies are continuing to report piracy incidents in the Gulf of Aden and the Strait of Malacca in Southeast Asia. Piracy attacks have dropped significantly off the coast of Somalia due to various factors, including active military action, land-based anti-piracy interventions and the increasing use of armed guards on board of ships. However, Allianz Global Corporate & Specialty (AGCS), a leading marine insurer, maintains that this region is still far from safe from pirate attacks. The industry sometimes likens the issue of piracy to a game of ‘whack-a-mole’. Opportunistic armed robbery occurs when a vessel is approaching or anchored off ports or when ship-to-ship transfers take place (e.g. oil or gas cargo). Usually pirates are after valuables, IT equipment, personal belongings and the cash often kept by the ship’s captain for conducting normal business in foreign countries. Cargo theft, mainly fuel oil theft, occurs when vessels are hijacked for several days and oil is transferred to a smaller vessel. This usually involves a criminal element and some maritime insider knowledge. Kidnapping is usually associated with the offshore oil industry and the instability of the Niger Delta. Typically, robbery is the main intent. Piracy is a major concern for the marine insurance industry. For instance, the West African territorial waters are excluded from the Hull War trading area and ship owners need to arrange insurance coverage for sailing into such areas in advance. A recent joint study by the International Criminal Police Organization, United Nations office on Drugs and Crime and the World Bank states that from 2005 to 2012, 179 ships were successfully hijacked off the Horn of Africa, primarily off the coast of Somalia. Another study, called ‘Pirate Trails’, using data and evidence from interviews with former pirates, government officials, bankers and others involved in piracy, explores the finances behind piracy and claims that over $339 million in ransom was paid during that period of time. Change routes up occasionally to avoid predictability when a vessel is in the region frequently and following a regular trade route. Prior to transiting the Gulf of Aden, alert the Maritime Security Centre for the Horn of Africa (MSCHOA) and advise of your voyage plans. Travel in assigned Transit Groups and utilize the International Recommended Transit Corridor (IRTC), which will allow optimal coordination of naval warships that are operating in the Gulf of Aden. Follow the guidelines contained within IMO’s Best Management Practices IV, such as ‘hardening your vessel’ by installing barbed wire to protect the hull and create an effective Citadel aboard ship. For vessels transiting West Africa, follow the Guidelines for the Gulf of Guinea, which have been created by Intertanko, BIMCO, NATO and other maritime organizations. The use of armed guard is a legal challenge. In contrast to the international waters off Somalia, coastal states in West Africa do not allow foreign armed guards to enter their territorial waters. Instead, the local navy or army must be used, a process bringing with it lots of uncertainty with respect to naval experience, being able to adapt to critical situations, training and reliability of people sent onboard. Former US Assistant Secretary of State, Andrew Shapiro stated: “The ultimate security measure a commercial ship can adopt is the use of privately contracted armed security teams. The reason for this is simple: to date, no ship with an armed security team onboard has been successfully pirated.” Yet, there have been instances where fishermen were mistaken for pirates and were inadvertently killed, such as the incident off the coast of India in 2012. Generally, insurers like Allianz do not endorse or condemn the use of armed guards. If clients choose to use them, then insurers recommend using those that form part of the Security Association for the Maritime Industry (SAMI). This organization certifies maritime security providers worldwide and its members comprise more than 180 security providers, consultants, trainers and maritime security, hardware and technology manufacturers worldwide. Allianz Global Corporate & Specialty has already propagated that more nation building is required in Somalia back in 2011. In Somalia as well as West Africa, the root cause for piracy is the poverty on land and the socio-economic realities of some of the affected countries. One of the driving forces behind piracy in Nigerian waters has been the failure to address the rampant black oil market, making theft a lucrative business. Pirates have become more sophisticated converting fishing trawlers into makeshift oil tankers or bringing some of the captured vessels close enough to the shore in order to siphon the oil into barrels to be sold on the black market. The US obtains 15 percent of its oil supply from this region, so the pirates see ample opportunity for profit here. Another contributing factor is the lack of a legal definition of Piracy and lack of legal jurisdiction for prosecution of piracy. The pirate ring leader Muse, who was captured by the US Navy in the Captain Phillips movie, was recently convicted in US federal court for Hijacking, Hostage Taking, & Armed Robbery, but not Piracy. This is because there is no legal definition of Piracy. Also, there is the lack of jurisdiction. Initially, pirates were being tried in Kenya, but the Kenyan government has since taken the position that these are Somali citizens, that attacked ships that are under foreign flags in international waters. So, how does Kenya have any jurisdiction or responsibility to prosecute these pirates? It is reported that over 1,500 pirates have been captured and released by naval ships because of the lack of any legal authority or jurisdiction for their detention or prosecution. In short, Piracy is a highly complex international problem that continues to exist as long as large income inequalities, poverty and political instability continue to exist. Its face might be changing, but we are still talking about the age-old risk.